October has become one of my busiest writing months in a while. I’m currently polishing up my next release and thought I’d share the cover with you all. This book has been such a fun one to write, and most of it takes place in Colorado during a blizzard. It isn’t easy writing about snow when you live in Texas. However, we had some temps in the 40s and 50s last week along with endless rain, and that’s probably about as close as we’re going to get to a blizzard here in the Hill Country. For this particular book, I had the cover designed before I ever started on the story itself. I’m blessed to have a talented photographer friend, Jennifer Pitts Photography. This couple was one of the many beautiful images she’s taken, and they were perfect for this book. Then an author friend of mine, Krista Noorman, designed the cover. I love how it turned out. 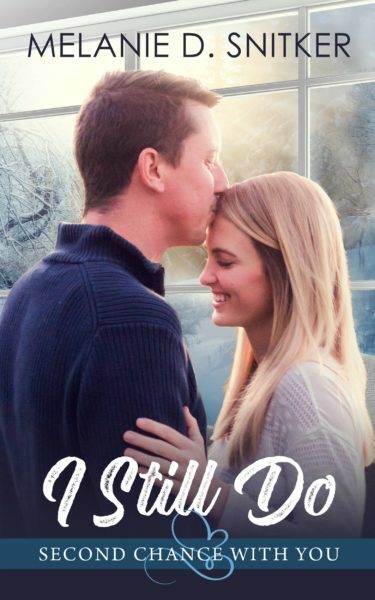 I Still Do is available for pre-order now, and releases November 13th. It is part of the Second Chance With You series which contains nine books that are all sweet and/or inspirational. What’s worse than running into your ex-husband? Becoming snowbound with him and an avalanche of memories you can’t escape. When Cora Wells married her high school sweetheart at nineteen, she thought it was the beginning of a perfect life together. Their divorce two years later shattered her heart. She thought she’d never see him again, until she agrees to go on a crazy trip to honor a loved one and comes face to face with none other than her ex-husband, Grey. Grey Jackson never could decide which was his biggest mistake–marrying Cora or divorcing her. He thought he’d moved past it all, but seeing Cora again brings every emotion back to the surface. There were a lot of things they never dealt with together, yet how can he expect her to open up to him now after he shut himself off from her years ago? When a crazy winter storm leaves them all snowbound, everything seems to go wrong, and Cora and Grey have no choice but to work together. As tempers flare and old wounds are re-opened, they must face the truth of what happened between them. Will it give them a second chance to rediscover their first love? In I Still Do, Cora brings a number of things on her trip to Colorado. In addition to her medical bag, she includes some protein bars that she’s addicted to. It turns out to be a good thing, because at one point, it’s all she and Grey have to eat. 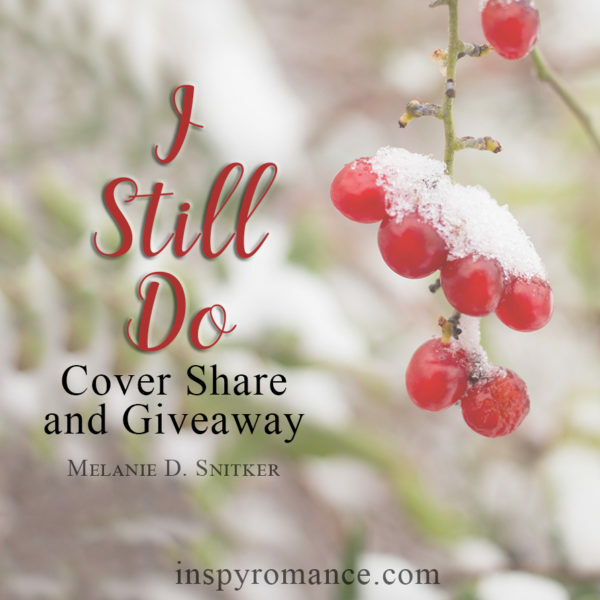 For your chance to win an autographed paperback of I Still Do (or any one of my other books), please comment below and tell us something you never travel without. Or share something you’d want to have with you if you were ever snowbound away from home. I’ll leave this open through the weekend and choose a winner on Monday, October 29th. I look forward to reading your responses! * Paperbacks can be shipped within the United States only. If the winner is international, a digital prize will be given in its place. Hi Melanie! Congrats and your upcoming release. Nice cover reveal. As a Michigander, who survived the big blizzards of 1968, 1978 / 1979, and 2013 /2014 with white out conditions and over ten foot drifts; I always chuckle at about the premise being caught in a snow storm. Seasoned Midwesterners do NOT venture out during a blizzard, we hunker down at home or at a friends or even at work (hotels, hospitals, nursing homes). In the January 2014 blizzard my son stayed at work for a week. Our cars are ready starting October with a winter tune up – battery checked, fluids checked, new windshield wipers and tires with traction are a must. Winters are rough on cars, especially when the windchill can reach up 80 below zero (January 1982). Starting October my car has the winter essentials: snow shovel, snow brush, a flashlight, blanket, boots, hats, gloves, food (granola bars, trail mix), bottled water and extra phone charging cables. What is sad that in our small Michigan town, not everybody has the means to winterize their cars and be prepared. Presently we are in the mild winter cycle. About every 10 years or so we have a severe winter with blizzards. 2013/2014 was the worst I experienced in my life time. Students had 6 snow days – a new record. First snow day was October 12. We still had huge snow piles mid June. Looking forward to reading your book. Best wishes. Hi Renate! It is funny to see the differences between areas and what people would consider a lot of snow. I grew up in Flagstaff, Arizona. So when my family and I moved to Oregon, we found it quite funny when people were snowbound because of two inches of snow. LOL It sounds like you get a LOT, though. And 80 below zero due to windchill? Yeah, I don’t think I could survive that! Wow, it sounds like the blizzards in 2013/2014 were crazy! I never travel without a little stuffed puppy. I’ve never been in a blizzard nor do I have an ex-husband, but I’m sure we can all figure out what happens in the end. Looking forward to reading, “I Still Do”. I never travel without… a phone charger. But you can’t eat that in a blizzard! Like Renate, we get Real Winter in SE BC, Canada, but not as cold. Our winters tend to hover a few degrees below freezing with random days above and usually a week or so of -20 to -30 Celsius. Here we tend to get a lot of wet, heavy snow which makes the mountain roads very slippery. When I had a day job, I phoned in SLICK a few times — more times than I ever called in SICK! Like Renate, we make sure emergency supplies are kept stocked in our vehicles: window scraper/brush, shovel, tow rope, jumper cables, tools (hubby’s a mechanic), boots, mitts, tuques, parkas, sleeping bags, protein bars, etc. Western Canada already had some nasty winter weather a couple of weeks ago, but it didn’t reach us here. I’m with you on never traveling without a phone charger! LOL about phoning in slick more times than you phoned in sick. Sounds like the winter weather can be really nasty there! Valerie! Yes Canadians are prepared for winter and the cold. -30 Celsius is -20 Fahrenheit. Depending how warm Lake Michigan got during the summer, depends how cold it gets in the winter. Most of the time we around freezing and the wind chill may be a few degrees colder, especially when the wind sweeps down from the north from COLD CANADA or Minnesota. Wind Chill is determined by temperature / humidity / and the speed of the wind and is dangerous especially when reaches -20 degrees Fahrenheit or lower (-28 Celsius or lower). Only experienced -80F/ -62C twice in my lifetime. Winter of 2013/2014 was the only winter that I remember in over 60 years that Lake Michigan was almost completely frozen over in January, February, March. I remember -70F when I was a kid in Manitoba. That was probably with the wind chill – not sure. It definitely got a whole lot colder out there than it does in most of BC! If I was stranded in the snow I would need my husband. I never travel without my lotions and potions! Lotions are good to have when it’s cold so that’s a good call! This is by far one of my absolute favorite troupes – reunited love!! I would love to read this story, it sounds wonderful, and I love snow and cold weather! I never travel without my ipad because all of my books are loaded onto it. I never travel without books! Now my oldest daughter is starting to carry a stack of books around like I do, it sure melts my heart! Awwww that’s wonderful! You can never go wrong with a stack of books! Books are always good, and a pillow for the car, too. Yes, wouldn’t it be wonderful to take a furry friends everywhere we go? My phone so I can stay in touch with my family and my Kindle so I can read. Both of those are great! Having books there to read makes all the difference! Since I was a little girl, I’d have a bag full of books (now it’s my kindle/phone). I usually carry granola bars in my purse in case of hunger emergency, but not many, just 1, sometimes 2… (this started when I used to drive home from college and sometimes I’d get into traffic jam.. for about 1-1.5 hours, which can definitely turn into a hunger emergency if I skipped/ate poorly at lunch). Carrying a granola bar is a good idea. And taking your Kindle and phone is, too! Hi Melanie. Gorgeous cover. My youngest is a family/pregnancy photographer. It never occurred to me until this moment that I ought to have her do some cover photography for me. I have gorgeous daughters who could definitely be models. Also, I got a kick out of you saying you live in Texas but were writing a Colorado blizzard. I write about Texas and live in the middle of those Colorado blizzards. Thank you so much! You should definitely see if your youngest could take some of your cover photos. It’s wonderful to have an image you know is unique to your book! That is funny that you live in Colorado and write about Texas – ha! I always travel with a blanket and water. I think it’s good thing to start adding little snacks to the mix. You never know when you might get stranded. Very true – it’s good to be prepared! I usually have my kindle in my purse when I go anywhere. When I travel long distances I have my phone and charger, my kindle and charger, and my iPad and charger. Those all important chargers! When I fly I also take snacks for the plane. I have been traveling from Pennsylvania to Alaska more and I need food during those 10 hours! Growing up, I always carried a blanket, a pillow, and a book for the car while Daddy drove us to vacation, and packed more books and my Bible for when we got there. I never travel without my iPod, tablet and a book or books. As a kid, I never went anywhere without my teddy bear and blanket (and fortunately they never got lost). That’s sweet you never went anywhere without your teddy and blanket as a kid. I’m glad you never lost them! Our daughter has to have a stuffed animal with her everywhere she goes! I never go anywhere without a book or my kindle. I’m the only driver in the family and I have a lot of “waiting” time. I also keep a notebook in my tote bag so if I finish a book while “waiting” I can write out my review and post it the next day on several different sites. Since I’m on several review teams I write the reviews and try to leave them within 24-48 hrs of try to never leave a review I can’t leave at least a 4 or 5. If its less than 4 I will send a private msg. to the author and explain why I can’t leave more and also tell her/him what I liked about their writing. I try to never critique without praise for what was good. Sounds like you have a great way to turn all of your waiting time into productive time! I never travel (even to the beauty shop or Dr) without a book. Having a book with you in one format or another is very important! I never leave home without a book. I always want to be prepared for the just in case. Yes! I find that I don’t have a lot of time to read right now, but when I find those rare spare minutes, I want to take advantage of it! either books to read, my kindle and charger and also plenty of snacks. I always have a few books and we pack a blanket bottled water and always snacks with us would love to read your book Thank you so much for the chance! Definitely all great things to have! Hey Melanie, I love the cover. My husband has family in the Hill Country. We visit every few years and I’ve written some books set in that area. Definitely no blizzards to speak of. Thank you, Shannon! That’s neat that you visit this area every few years. I’ve heard snow in general is pretty rare around here. Thank you! And I agree, books are completely necessary! I never travel without my phone/charger and I always have children’s Tylenol and such for my kids. I don’t want them to get sick while out of town and not have quick access to meds. Funny thing though, my kids rarely get sick and I don’t give medicine quickly, but still always travel with it. I never travel without a phone charger or something to read and my adult coloring book. May be some kind of puzzle book. Thank you for the giveaway. An adult coloring book – what a great idea! Thanks for sharing! Sounds like a super book! I never travel without my supply of medications – allergy meds, Tylenol, Motrin, Epi Pen. Thanks for the FuN, Melanie ! Thank you so much, Sharon! I appreciate it!